Description: In keeping with the Mission style of translating objects into geometric forms, the Meyda design team transforms an Amber Mica diamond design into this stunning wall sconce. 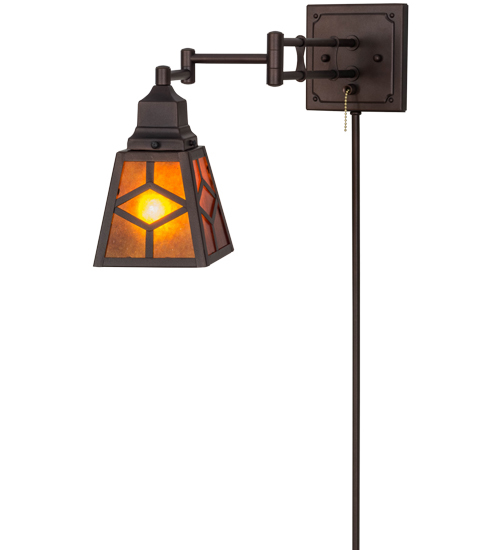 This wall fixture features a swing arm that adjusts the shade for various reading applications above a bed or other locations and includes a 40-inch cord cover with a mounting bracket and pull chain on/off switch. The hardware is hand finished in a warm Mahogany Bronze and the fixture was handcrafted in the USA.